Holidays are just creeping up on me these days. Easter is one that I try to think and plan through but I still feel like I'm scrambling to get us where we need to be at times! It's life. But it's important to slow down - especially as Christians at this time - and remember who we are and Who we believe in. And why. Truthfully, I don't know what what this Easter will look like because I still don't know where we'll be living. Before we were smoked out of our house, I had the opportunity to go through a couple of new titles, and I'll share one of my favorites. 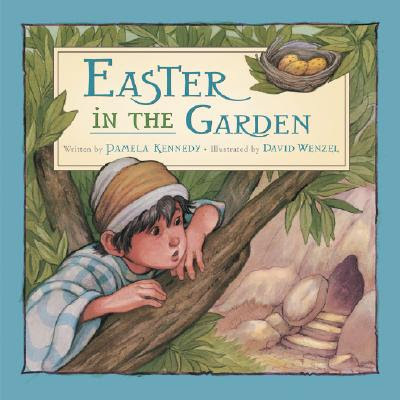 Easter In The Garden , by Pamela Kennedy tells the story of Micah, a young boy who lives with his parents in Jerusalem. His father is a gardener and their family is friends with a man named Jesus. Micah witnesses angry people and soldiers coming to Jesus in the garden which he and his father tend and he feels frightened by all that he sees and hears (which are, of course, the events leading up to the crucifixion.) But then he also witnesses women going to the tomb and discovering that Jesus is alive! Of course, a child would not have been privy to all of these events and so the character of Micah is usually hiding in trees and behind bushes, describing the things he sees and how it all makes him feel. I thought the story was handled nicely and was not overly emotional or cheesy. It accurately depicts a sense of fear that many of Jesus' followers would have felt upon discovering that he had been "taken away and killed." I rather recommend this one. Many thanks to Ideals Children's Books for shooting a copy of this one my direction to check out! 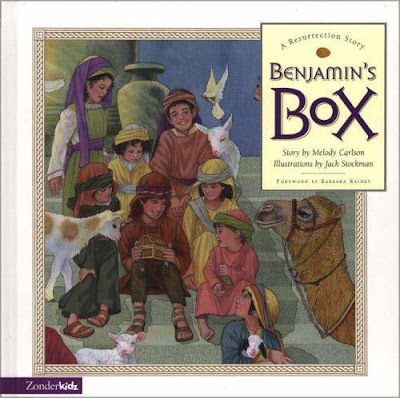 For the past few years we've used Benjamin's Box: The Story of the Resurrection Eggs , by Melody Carlson and really enjoy doing so. This book tells the story of Jesus' death and resurrection over a period of days. Each day you open up one of the resurrection eggs and find something relevant to the story (a small nail, a thorny branch, a piece of cloth, etc.) and you follow along with Benjamin in learning about the events during Holy Week. Benjamin's Box is an extremely useful tool as it helps not only make the story of the cross approachable, but understandable. Last year Bookworm1 (then age 4) started to really grasp the message of the cross as we used these stories. We're happy to be revisiting Benajamin and the eggs this year also. This one receives a "highly recommended" from our family. Are there special religious Easter books that you and your family use on a yearly basis? I'd really love to hear about them as I'm still in the process of growing our home collection. Do share! I've been wanting to purchase Benjamin's Box. We have the plastic egg carton that tells the story of Easter and I was told that the Benjamin's Box book coincides with it nicely! We have a handful of Easter books that I just pulled out. I'm looking forward to reading them with my kids. I still need to dig out our Resurrection Eggs so we can do that as well.